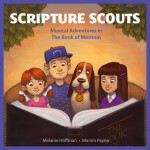 ‘We’re the Scripture Scouts!’ says Baby. ‘And we love to read the scriptures and act them out in our treehouse,’ says Skyler. ‘And best of all, we love to sing about our adventures,’ says Sue. ‘So join our club and sing along!’ says Boo, the baritone hound. The Scripture Scouts sing fun, catchy songs and act out little skits as they entertain and teach young listeners stories from the Book of Mormon, the New Testament, the Old Testament, and the Articles of Faith.